Stepping Stones pride ourselves on the commitment and dedication of our staff. Stepping Stones Nursery have been established for over 18 years. With the majority of staff being employed with us for over 10 years, some being here since we opened our doors in 1999. Stepping Stones Nursery consider ourselves to be the leading childcare provider in the Aberdare area. We are proud to say that over 80% of our intake is from returning families and recommendations. We are inspected annually by the CSSIW and receive exceptional results year after year. Stepping Stones Nursery follow all new and existing guidelines set by the Governing Bodies. Ensuring we provide the best possible child care. Stepping Stones feel that most parents want their child to be given a ‘home from home’ experience when at Nursery. 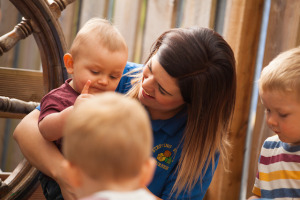 Although learning is very much apart of everyday life at Stepping Stones, we do feel that our priority with this age of children is care, attention and fun. The facility is state of the art and has a dedicated management team that are happy to answer any of your questions.